Do you remember the images of the Motorola Rival A455 that we showed you back in March and then in early May? If not, here are some new ones that we just received today, showing that it will be available in a silver & black combination and a purple & black combination. 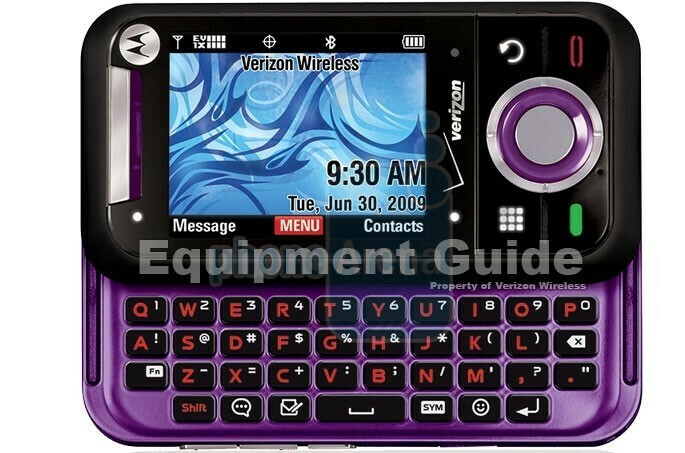 The choice of colors and overall styling make it look like it is mostly geared to teens, so it's good to know there's also a sliding QWERTY keyboard for all the text messages they'll be sending out. 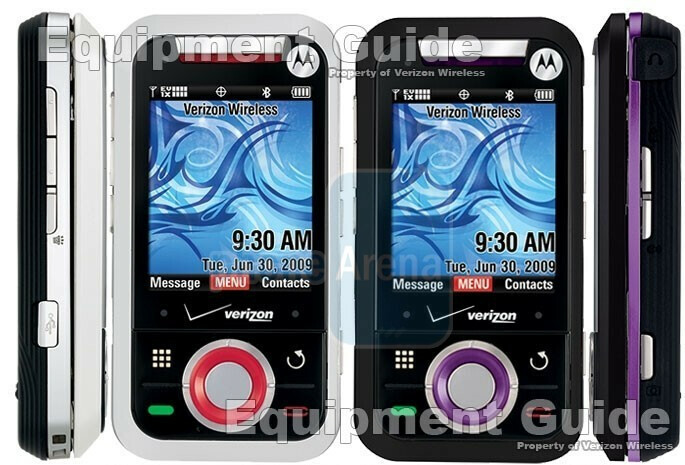 Other features include a QVGA display, 2MP camera, microSD memory card slot, and a microUSB charging port. The display is touch sensitive, but appears to be only used for dialing phone numbers. There's no word yet on pricing, but it's in Verizon's system as with a projected release date of June 10th. With the enV3 out in two days and enV Touch later next week, it will be interesting to see if the Rival lives up to it's name. 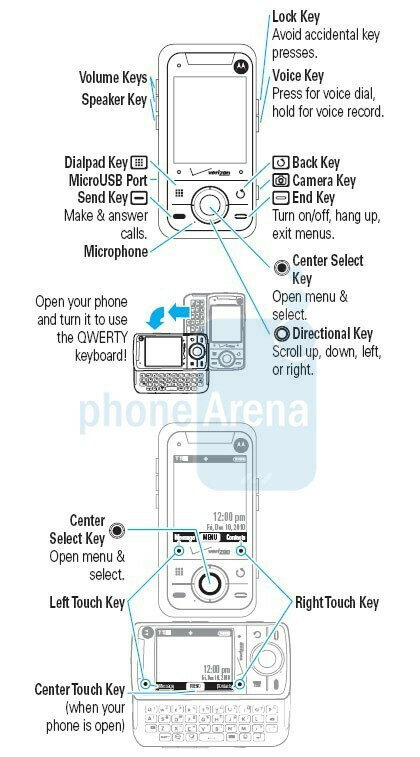 A friend of ours was able to nail down the final specifications of the Motorola Rival. First off, the screen resolution is 176x220, not QVGA as originally thought, and it is 2.2" in size with 65K color support. The camera is indeed 2MP, the headset jack is 3.5mm, and microSD support is 8GB. The size of the Rival is 3.8"H x 2.0"W x 0.71"D and has a weight of 4.40oz. Release date is set for June 10th. This is a cute phone. It will only stand a chance if it has a low price though. Im thinking like $49.99. The competition is thick. The new Alias is out, the env3 and touch are on their way, and on top of that look at all of the messaging phones Verizon has already!!!! I think a cute commercial would help it too, sumthing like the "LG Decoy" commercial, with a fun song. It will make it a day and then be pulled to the prepaid phone purgatory of big red. Really? Why even bother? It is actually pretty cool. I looks like a Chocolate/Rumar hybrid phone. Looks like if the Glyde and the Rizr had an ugly baby. i think it's a great looking phone. jeeez tough crowd. I think it looks pretty cool. I personally like the form of a slide out keyboard. I hope that Samsung comes out with a new Glyde that has the same factor but is actually good. I would by it. i think this phone looks awesome and its a great concept and im really happy that verizon is actually having a side slider phone that may actually work compared that dumb samsung glide!